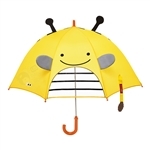 Whether they're hopping through puddles or bouncing to the bus stop, your toddler will love venturing out into the rain carrying their very own umbrella. The innovative peek-a-boo windowpane makes it easy to see wha's ahead in crowded places, while protecting little faces from wind and water. With a child-sized handle and kid-friendly release it's easy for little fingers to safely open and close. 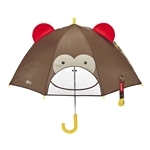 Featuring coordinating closures and 3-D ears, this whimsical umbrella coordinates with our Zoo Raincoat and is sure to become your little one's favorite rainy day accessory. 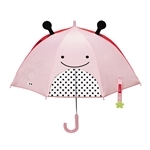 Whether they're hopping through puddles or bouncing to the bus stop, your toddler will love venturing out into the rain carrying their very own umbrella. The innovative peek-a-boo windowpane makes it easy to see wha's ahead in crowded places, while protecting little faces from wind and water. With a child-sized handle and kid-friendly release it's easy for little fingers to safely open and close. 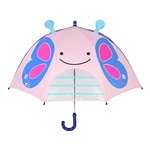 Featuring coordinating closures and 3-D ears, this whimsical umbrella coordinates with our Zoo Raincoat and is sure to become your little one's favorite rainy day accessory. 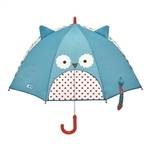 Whether they're hopping through puddles or bouncing to the bus stop, your toddler will love venturing out into the rain carrying their very own umbrella. The innovative peek-a-boo windowpane makes it easy to see wha's ahead in crowded places, while protecting little faces from wind and water. 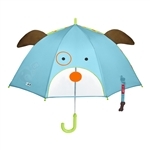 With a child-sized handle and kid-friendly release it's easy for little fingers to safely open and close. 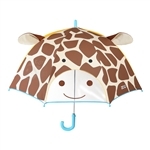 Featuring coordinating closures and 3-D ears, this whimsical umbrella coordinates with our Zoo Raincoat and is sure to become your little one's favorite rainy day accessory.